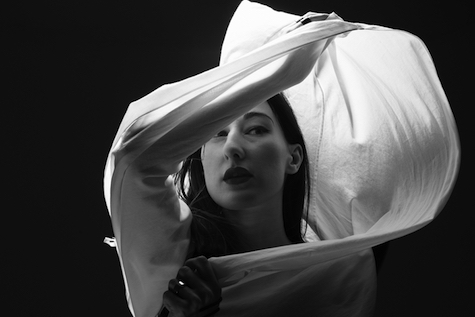 Zola Jesus plays The Waiting Room Oct. 11. Photo by Tim Saccenti. After seeing Zola Jesus perform at SXSW in 2012 I walked away thinking frontwoman and creative force Rosa Danilova was an indie Gaga. I couldn’t take my eyes off her as she exploded into dance the moment the band broke into its dreamy, spiritual, post-ambient rock drenched in synths, guitar and drums. Her music has been compared to Cocteau Twins and Dead Can Dance, though it bears an even darker tone on her latest album, Okovi, released last month on Sacred Bones Records. Zola Jesus’ Rosa Danilova: It changes. Right now it’s the Stalker OST. Being able to insidiously connect with people I’ve never met. The pressure it makes me put on myself. Well, I once cried on stage at Silencio in Paris. Not my best moment. Thankfully, I am, though it takes a lot of work and sacrifice. I tour a lot and live in the middle of Wisconsin, which is cheap. It helps make it possible to focus on doing what I love. Sometimes I wish I would be an architect, but I would build very bad buildings. I’m sure they would collapse. I’ve worked many jobs in the past and was fired from most of them. I’m not a very good employee! I’m not sure I’ve heard many stories, but I sort of glorify Omaha in my mind. Being a midwesterner from Wisconsin, I feel companionship with Nebraska. Which is why I’m excited to finally play there. Zola Jesus plays with John Wiese and Ivan Zoloto Wednesday, Oct. 11, at The Waiting Room, 6212 Maple St. Tickets are $15. Showtime is 8 p.m. For more information, go to onepercentproductions.com. Tonight Brooklyn noise rock band Ice Balloons (Volar Records) plays at fabulous O’Leaver’s. The band includes Kyp Malone of TV on the Radio and members of Samiam, among others. Benny Leather (Ben VanHoolandt of Digital Leather) and Low Long Signal open. 9 p.m. $5.